Perfect location for everything! Right across the road from the beach and next door to some of the most beautiful food in Palm Cove. 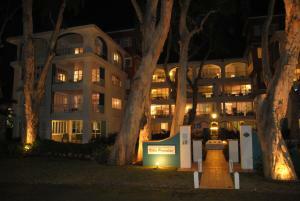 Wonderful location, beautifully well appointed apartment and lovely, polite and helpful staff. Our unit was largely protected from the strong breezes while still having an awesome view of the beach. The unit, whilst older, was comfortable and suited our needs. The managers were extremely helpful and accommodating. Good access, large comfortable apartment. It was a great place to unwind. Great spacious apartment. Fully equip kitchen. Even a box of toys for the kids. Location was great, easy walk to beach, food and shops. View from room very nice and room nicely appointed and comfy. Front gardens with large trees specially nice and create a beautiful setting. Great location and size of apartment was excellent. Location, pool, nearby restaurants and bars were good. Lock in a great price for BeachView Apartments at Villa Paradiso – rated 9.2 by recent guests! BeachView Apartments at Villa Paradiso This rating is a reflection of how the property compares to the industry standard when it comes to price, facilities and services available. It's based on a self-evaluation by the property. Use this rating to help choose your stay! 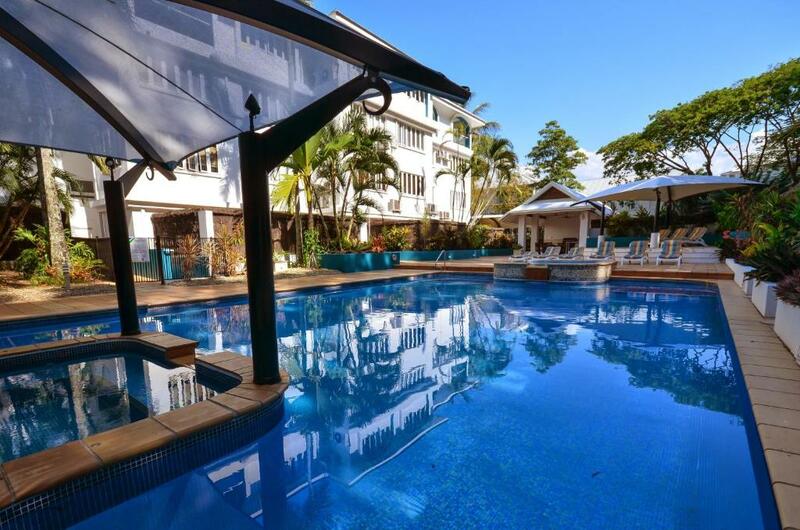 One of our top picks in Palm Cove.Located on the beachfront in Palm Cove, BeachView Apartments offer a private balcony with views of the Coral Sea. The property features a swimming pool and barbecue facilities. Free WiFi is available in all balcony and lounge areas of the apartments and in all public areas. Each spacious apartment is furnished with local crafts and includes a digital LCD TV in the lounge and bedroom, and 10 channels of free satellite TV. The property has a large terrace with an outdoor pool, which is heated during winter. Covered barbecue facilities are located next to the pool. The tour desk is operated by experienced locals who can arrange trips to the Great Barrier Reef and the Daintree World Heritage Rainforest. BeachView Apartments at Villa Paradiso is just 12 mi from Cairns International Airport and airport transfers can be arranged on request. Free secure parking is available on site with elevators to most apartments. When would you like to stay at BeachView Apartments at Villa Paradiso? This spacious, self-contained apartment features a large balcony or patio with ocean views. It includes air conditioning in the bedroom, a full kitchen, laundry facilities, an in-room safe and an private bathroom. This spacious, self-contained apartment features a large balcony or patio with ocean views. It includes air conditioning in the bedrooms, a full kitchen, laundry facilities, an in-room safe and 2 bathrooms (one is an private bathroom). This spacious, self-contained apartment features a large balcony or patio with ocean views. It includes air conditioning in the bedrooms, a full kitchen, laundry facilities, an in-room safe and 2 large bathrooms (one is an private bathroom). Villa Paradiso is the property Palm Cove was built around, is the center of the community and on the beachfront. All apartments have views of the Coral Sea and have Free Wifi in the living areas as well as in the pool/bbq area at up to 50Mb/s on our new NBN service. After long careers in customer services and in the electrical industry, then on the Gold Coast in a property management role, we have managed this property for 12 years . 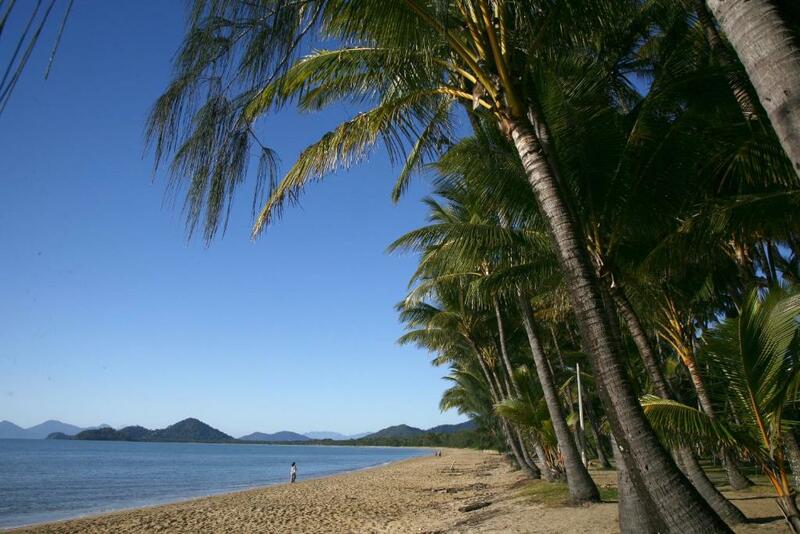 Palm Cove is a very peaceful community that has a warm and sunny climate. The beach is generally calm and for added safety is patrolled by surf lifesavers. There is an immense number of options to access to the nearby Great Barrier Reef and all it has to offer. Cairns International Airport is just 30 minutes away. House Rules BeachView Apartments at Villa Paradiso takes special requests – add in the next step! BeachView Apartments at Villa Paradiso accepts these cards and reserves the right to temporarily hold an amount prior to arrival. Please let BeachView Apartments at Villa Paradiso know your expected time of arrival. Please inform BeachView Apartments at Villa Paradiso of your expected arrival time in advance. You can use the Special Requests box when booking, or contact the property directly using the contact details in your confirmation. Only thing was a little bit of washing powder for laundry would be good. Too much to buy detergent for one wash. Oh and pool out back a bit soulless might look better with gardens like the front. We stayed 7 nights but didn’t get fresh towels, fresh linen. At least one ‘service’ for a 7 night stay should be the minimum. Comfortable and very well equpped apartment. Location just at the beach, nice swimming pool. It was very quite not like some of the bigger resorts, nice surroundings. The staff were very helpful and friendly. Great position opposite the beach. In the centre of the restaurant belt. Can recommend apartment number 1 on the ground floor. Very roomy and well provisioned for entertaining. Plenty of crockery, cutlery and bbq tools. Air conditioning was very welcome for the tropical weather. The Sunday markets along the beachfront sold very good quality items, mostly locally made. Location & convenient to everything we needed. Location, size and great value. There was nothing not to like about this place.